Coriander / Cilantro - What would Asian cuisine be without it? | Love.Food.Asia. Coriander also known as cilantro, Chinese parsley or dhania, is an annual herb in the family Apiaceae. The green herb is native to regions spanning from southern Europe and northern Africa to southwestern Asia. It is a soft plant growing to 50 cm (20 in) tall and the leaves are variable in shape, broadly lobed at the base of the plant, and slender and feathery higher on the flowering stems. The flowers are borne in small umbels, white or very pale pink, asymmetrical, with the petals pointing away from the center of the umbel longer (5–6 mm or 0.20–0.24 in) than those pointing toward it (only 1–3 mm or 0.039–0.118 in long). The fruit is a globular, dry schizocarp 3–5 mm (0.12–0.20 in) in Diameter and the seeds are generally used as a spice or an added ingredient in other foods or recipes, although sometimes they are eaten alone. What is used from the plant? All parts of the plant are edible, but the fresh leaves and the dried seeds are the parts most traditionally used in cooking. 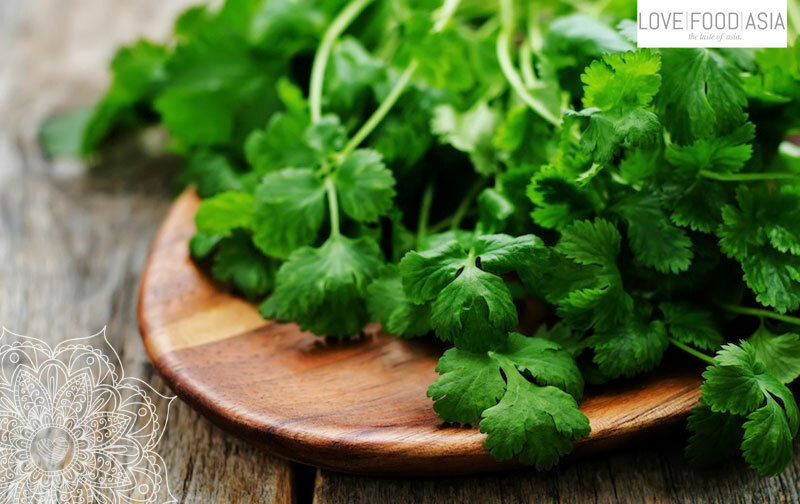 Coriander is common in South Asian, Southeast Asian, Indian, Middle Eastern, Caucasian, Central Asian, Mediterranean, Tex-Mex, Latin American, Brazilian, Portuguese, Chinese and African cuisines. The fresh leaves are an ingredient in many Indian foods (such as chutneys and salads); in Chinese and in Thai dishes. There are thousands of dishes where the leaves are served as topping, ingredient or just as a side dish. Researchers now think they know why coriander elicits such a ‘marmite’ reaction in people -and they said it could be in your genes. Statistical geneticist Nicholas Eriksson and colleagues worked through a genetic comparison of two separate samples of over 10,000 people. One was one a full range of people of European ancestry who said coriander tasted like soap, the other one of people of all genetic backgrounds who had declared their like or dislike of coriander. The result was a correlation between disliking coriander and two genes – one associated with enjoying smells, and another associated with linking smells to taste. Well, there are so many recipes where coriander is more than necessary as an ingredient. We are interested in your opinion. How do you like this post? Let us know how you liked it. Make a comment, rate it or post your own photo with #lovefoodasia on Instagram. Thanks for your support!